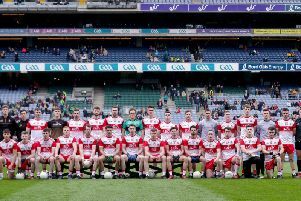 Disappointed joint Drum manager, Kieran O’Kane, admitted his side had paid the penalty for failing to take chances for the second week in succession. A disastrous opening 11-minutes left St. Colm’s trailing by 10 points but they recovered to bring the deficit back to a manageable four points with still over a quarter of the game to go. The frustration though was that by that stage they had already registered six wides from excellent positions. “We talked about getting off to slow starts,” conceded O’Kane, “We got off to a slow start and before we knew it we were 10-points down. But first of all, I want to wish Faughanvale all the very best in Ulster. They are a good side, they work hard and we tried to match them. We’ve had five epic battles them this year. “I want to thank the referees and officials. We’re a team that when we’re beat we don’t take to social media to blame referees, officials, other teams. We accept our defeats. You have to know how to lose as well as how to win. Officials and referees do their best, and no matter what happens we take their decisions. Conor O’Kane’s 42nd minute goal which brought it back to 2-06 to 1-05 looked like being the launch pad for an unlikely comeback but unfortunately for Drum, it wasn’t to be. “Aye, I thought we were back in it,” added O’Kane, “There was only four points in it and I thought, ‘we have them’. Look, we went 10 down and came back and hit four points but missed six wides. We missed six scoreable chances on the trot which would have brought it back to a draw but you have to finish them. The defeat caps a miserable end to the year after St. Colm’s who missed out on promotion in a tight play-off against Moneymore but O’Kane believes the players will recover although he does not know if himself and Jason Hazlett will remain in charge.